December 28, 2017 February 24, 2018 - by Naomi - 2 Comments. Now you hear the word “bitcoin” and “cryptocurrency” more often than ever. I’m Naomi. 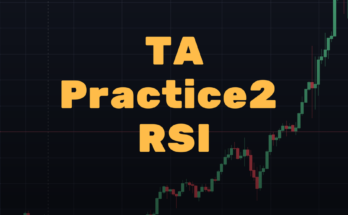 I started trading Cryptocurrency last year. So I’m still a noob but I’ve been learning a lot. 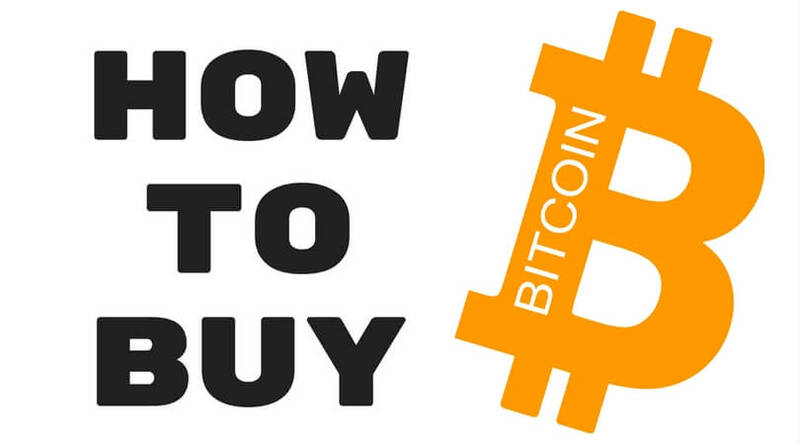 I’m introducing how I started buying Cryptocurrency in this article. You can search that in google and you will find many results with complicated explanation. Basically, it’s a digital currency but it’s not like the money in your bank account. It’s not controlled by a government or banks. 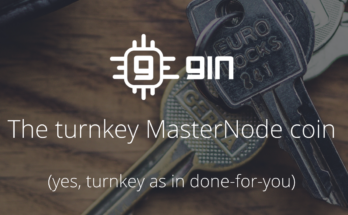 You can send money to anyone without going though any middleman. Banks can be hacked but you can’t hack cryptocurrency. Of course, exchanges can be hacked but not the cryptocurrency its self. There are so much more to Cryptocurrency but I will explain it later. 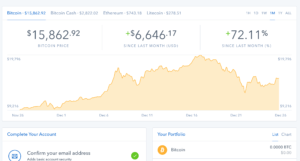 Even though this site talks about binance.com often but Coinbase is where everybody starts because you can’t buy coins at Binance with USD. 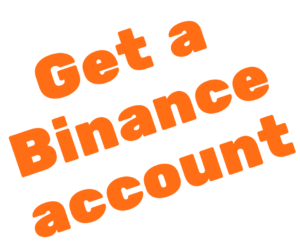 You can always transfer your coins to binance.com and start trading with more coins soon after you buy coins at Coinbase. 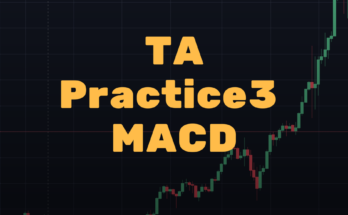 It’s the most popular cryptocurrency exchange for beginners and also I personally still use to convert my funds from USD to Bitcoin or ETH and vice versa. 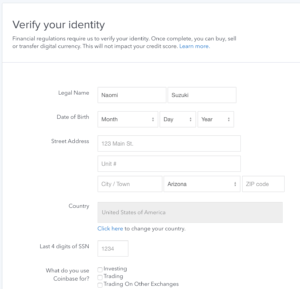 I would like to show how to register Coinbase and transfer coins to binance.com. Fill out the form and sign up. You will receive an email so click the link in it! After filling out everything and submit, you should see this. After clicking continue, you should finally see the dashboard. In the dashboard, click “Add a payment method”. 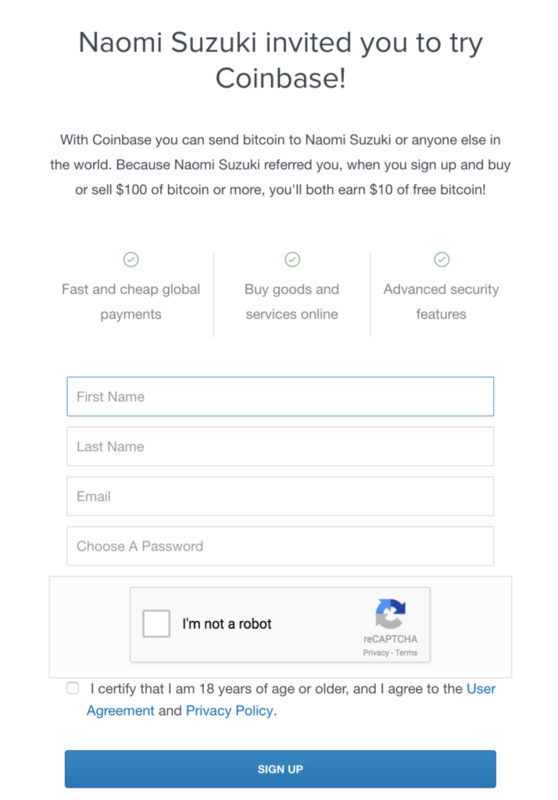 It should show you your options for the payment method. You can add multiple methods. You probably want to choose either Bank Account or Credit/Debit Card. You can see the detail here. So basically if you want to get coins right way, you should use the Credit/Debit card way but you will be paying more fees. 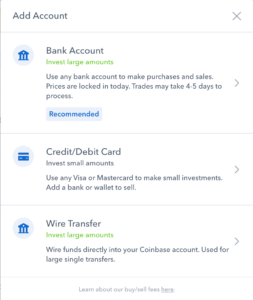 One thing you shouldn’t forget is when you purchase coins with the Bank Account method, the price is locked to the moment you make a purchase. So if you buy 1 bitcoin when the price is $13000, and if the bitcoin goes up and becomes $16000 when you receive the coin, you still receive 1 bitcoin so the price is $16000. 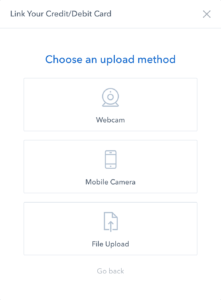 When you try to add a method, it will ask you to upload a photo id. This is the part that turns many users down since it’s a hassle. 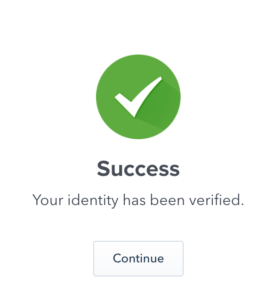 I originally tried to create an account on a different site a long time ago when bitcoin costed only $700 but I stopped when they asked me to upload the scan of my id but now I regret it. 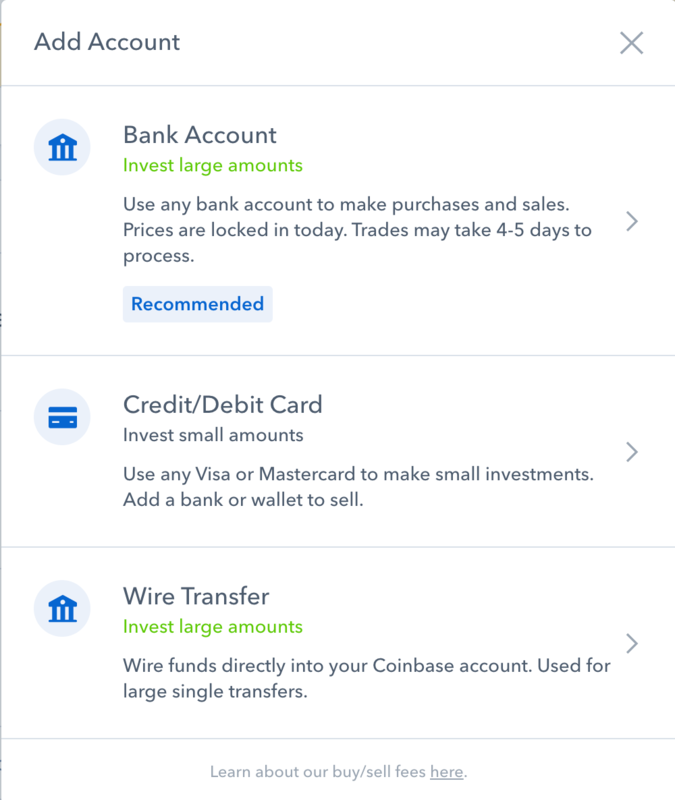 Luckily, Coinbase made it so much simpler to do this process. 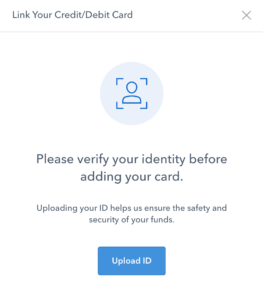 After choosing the method of payment, it will ask you to upload your ID. 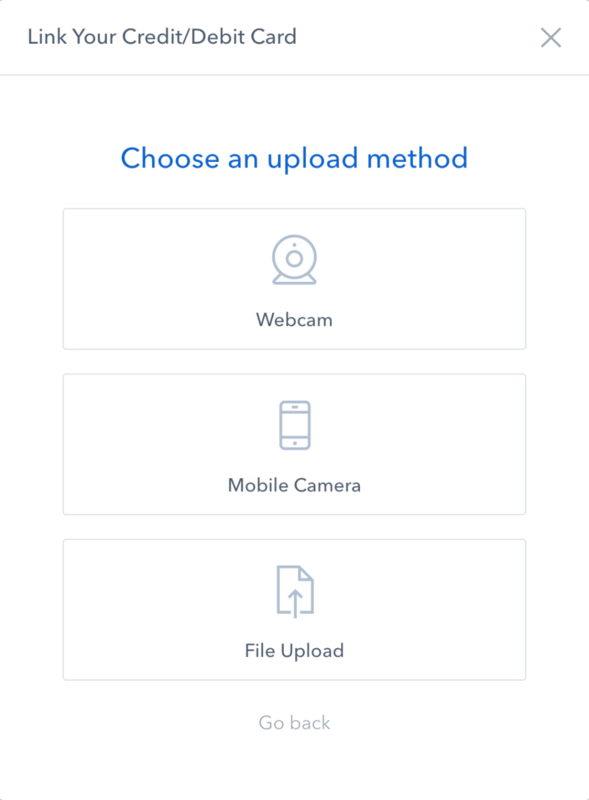 I recommend to use “Mobile Camera” method. On your mobile phone, you will get a link to upload your driver’s license or whatever the ID you choose. Follow the instruction and upload images. They take from 10 mins to a few days to verify your identity. Once it’s done, you will receive an email and you will be able to login! 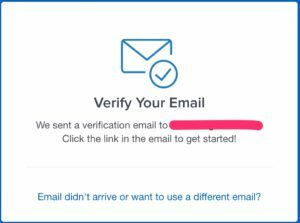 Here is the detail of your verification process. Please continue to the next article. You are welcome! I’m learning a lot too.